Lud Foe might just be a savior to the current state of hip hop, not your classic hip hop lyricist but a youthful artist full of wild and energetic bars. The Chicago voice seems to be a breath of fresh air from the current wave of nerdy fiends teaming up throughout the industry, the last of a dying breed as he carries the torch with a handful of artists in the game. Behold, "No Hooks 2", it has been a long time coming for the highly anticipated project but the day has finally come. Arguably the hottest artist out of the Midwest, Foe spits to you on his classic No Hooks flow with 21 high energy records that are sure to wake you the hell up. Coveted producer Kid Wond3r returns and 808Mafia makes an appearance as they feed Lud Foe and a few members from his YSN team the necessary production to set a blaze the entirety of the project. The sky seems to be the limit with Foe and it's just the beginning, finishing up his tour with Tee Grizzley, labels calling, solo projects charting, millions of streams, and it all seems to be in house with little to none collaborations. 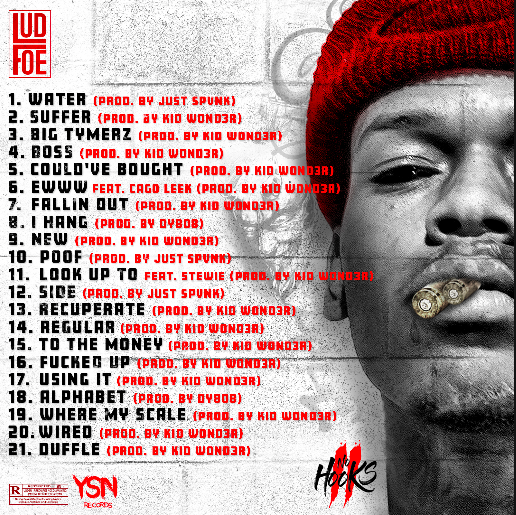 Listen up & lock in to this wave Lud Foe is creating as the project is sure to go down as yet another classic in the artists discography. DO YOU REMEMBER? In March of 2017, at about 3am Lud Foe was involved in an almost fatal car accident with an 18-wheeler truck, on the West side of Chicago. Although the accident spared his life, he was left with 2 broken wrists and a broken jaw; doctors told him he may never be able to perform again. Just 4 days after the accident, with his mouth and jaw completely wired, Lud Foe began what is now, No Hooks 2. YK OSIRIS Got The Flow & Soul, Claims "I'm Next"